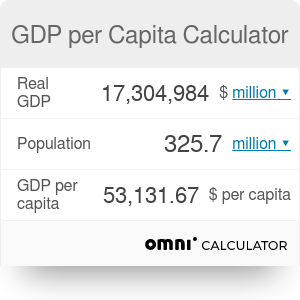 GDP per capita calculator is a tool to compute the Gross Domestic Product per unit of population in a given country. If you read further, you can learn how to calculate GDP per capita and get familiar with the real GDP per capita definition. Besides, you can gain some insight into why this indicator is vital in macroeconomics and get some data on the GDP per capita of different countries. The Gross Domestic Product (GDP) is one of the most prominent indicators in macroeconomics. It is devised with the purpose of measuring a country's total economic output, that is, the amount of goods and services produced domestically. Since the inflation rate might bias the nominal (unadjusted) GDP for different years, economists typically work with real (inflation-adjusted) GDP values. Still, the real GDP is not the most reliable indicator to measure the standard of living or make a comparison between countries. As GDP is equal to the total income of a country, its average fraction for each person in the countries population gives a better proxy for the standard of living. To see the difference between these indicators let's have a look at the below table with real GDP and GDP per capita data from different countries between 2007 and 2017. By contrasting these years, we can have some insight into not only how economies changed throughout a decade, but we can see also how countries dealt with the global financial crisis of 2007-2008 and its aftermath. In both years the United States had the highest real GDP; however, the US GDP per capita is still lower than in Switzerland. It means that even though the US economy produced the highest value, Swiss people enjoyed a much higher standard of living. Among the listed countries, China's GDP per capita doubled, thanks to its high GDP growth rate; however, its standard of living is still far from that of developed nations like the United States. In contrast, Greece, the Eurozone state which was hit hardest by the 2008 crisis, saw its standard of living drop over the last ten years. Another interesting point is that despite its incredible growth, India's GDP per capita is still far lower than the world's average. If you are curious about which countries people are the wealthiest, the ranking below gives you a practical guideline. The table represents the 20 countries with the highest GDP per capita (purchasing power parity, international dollars) based on a projection by the International Monetary Fund (IMF) outlook for the year 2019. According to the list, the US GDP per capita takes only the 12th position. Qatar has the highest level of average standard of living where people, in general, are twice wealthier compared to an average person in the United States. There is another aspect that is needed to get an exact picture of the material life of a society. Albeit high GDP per capita means high average income, if the economy is characterized by high inequality, the range of people living in impoverished circumstances is wider. Therefore, the number of people living in poverty, one of the most crucial issues in our society, depends on the level of the average GDP per capita and the degree of economic inequality. Accordingly, there are two direct ways to reduce poverty: either boosting the GDP per capita or reducing inequality by redistributing resources from the rich to the poor. GDP per Capita Calculator can be embedded on your website to enrich the content you wrote and make it easier for your visitors to understand your message.